Haverfordwest in Britain's only coastal National Park of Pembrokeshire is justifiably famous for its rugged cliffs, quiet coves and expansive sandy bays. This was to be the setting for the Endurancelife epic trail run event offering a range of distances for all. Emma Croxon took on the 10km (7.6 mile) distance, completing the race in 2:11:54 (140th). Whilst John & Angela Phillips battled the ½ marathon (15.3 mile) course completing in 3:34:25 & 3:34:26 (239th/240th). 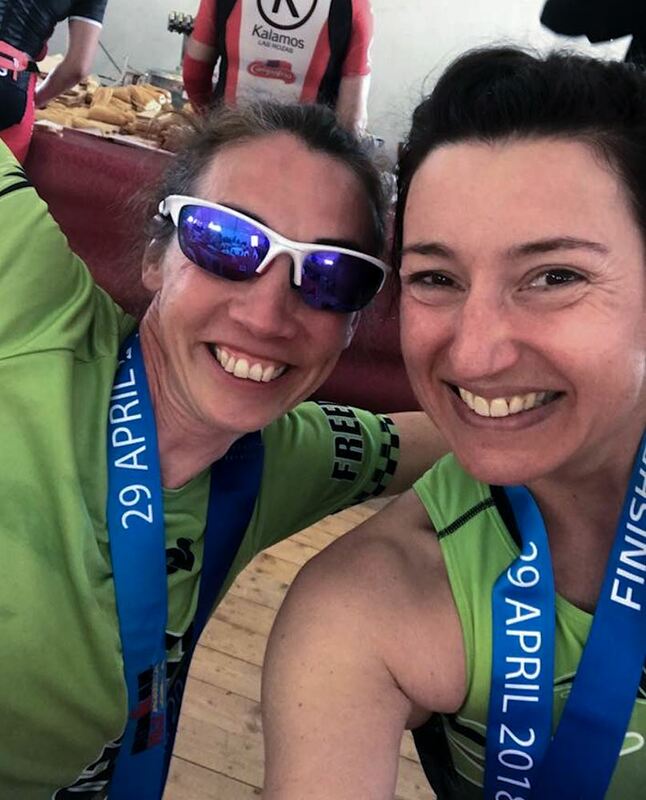 It was marathon or bust for self-confessed running fan Liz Aitken who tackled the gruelling cliff top 27.8 mile course, finishing in 7:09:27 (126th), and still with a smile on her face. Race support was cheerily provided by Sara O'Callaghan & Sarah Taylor. It was some-what warmer over in the Costa del Sol where the Mediterranean city of Marbella was hosting the inaugural Ironman 70.3 triathlon. 2500 triathletes descended on Puerto Banŭs all vying for 50 qualifying slots for the Ironman 70.3 World Championships coming up in South Africa later this year. 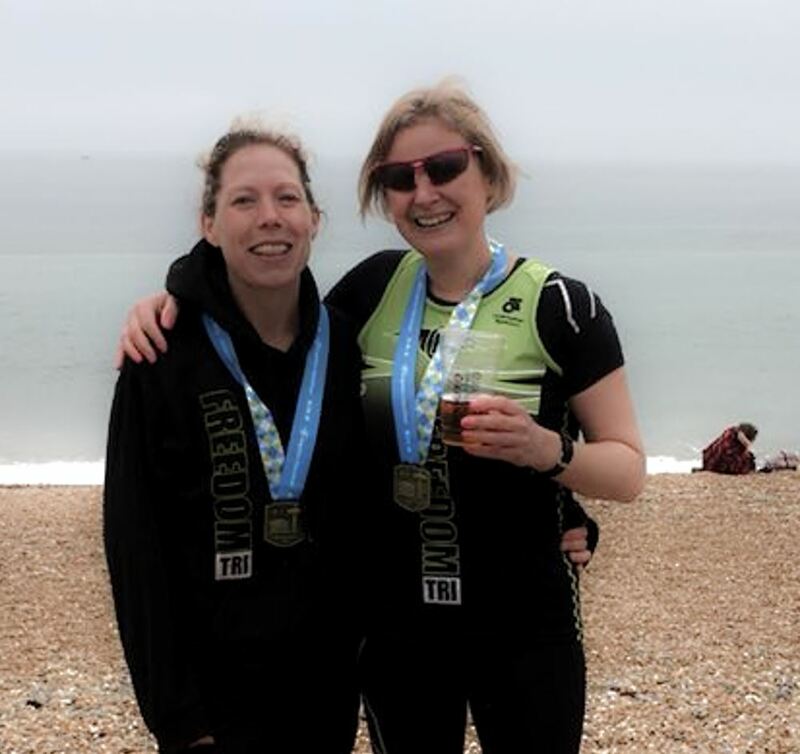 Veteran endurance athlete Suzy Hawkins along with Rachel Kelley took on the mighty challenge of a 1.9km sea swim (shortened due to windy conditions) followed by a 90km bike, including two 25km climbs, topped off with a half marathon. Suzy was overjoyed to step onto the podium with 3rd place in her age group in a time of 5:21:56 (426th) whilst Rachel also did very well with a 16th place age group position in a time of 6:31:51 (1301st). Well done ladies on an excellent day of hot & humid racing. Meanwhile Matt Cotter was breaking a personal record by 5 minutes at the Wimbledon Half Marathon crossing the line in 1:53:07, 42nd in Cat, 260th overall. Looks like he's all set for a cracking season to come! 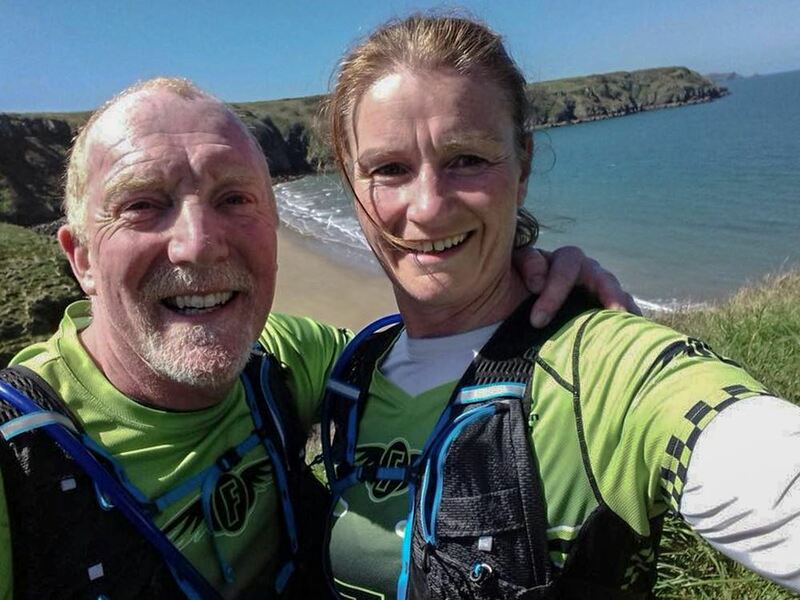 John & Angela Phillips at Endurancelife Pembrokeshire. Suzy Hawkins & Rachel Kelley celebrate at Ironman 70.3 Marbella. 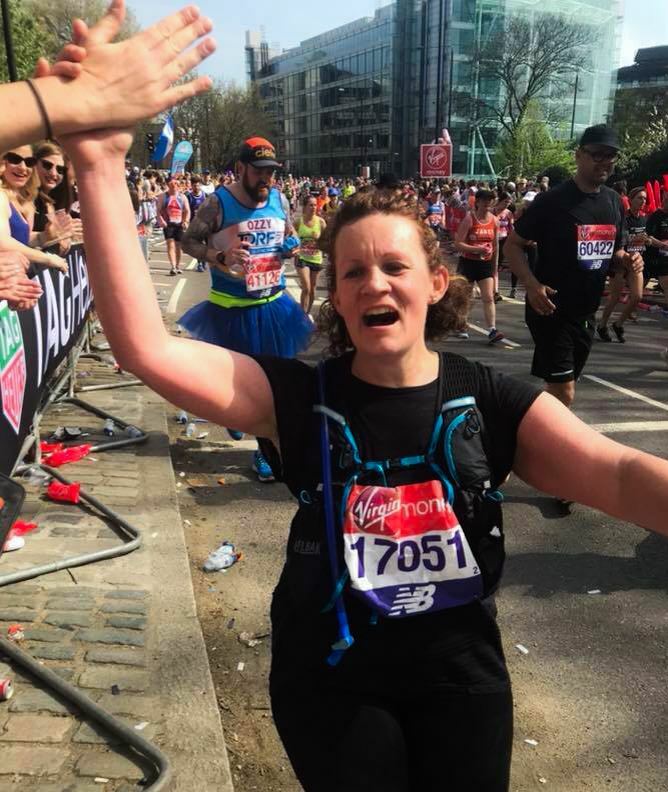 Over at the London Marathon in record temperatures of 23.2C Steffan Ford crossed the line in an impressive 2,287th place with a time of 3:13:44 (449th Cat. ); Jenny Cotter also had a great run in 7,068th place with a time of 3:47:24 (170th Cat. ); Thomas Sauka was in 11,467th place in 4:09:38 (1693rd Cat. ); Amanda Smith in 26,370th place in 5:15:48 (4,658 Cat. ); whilst Sara O'Callaghan was in 34,133rd place with a time of 5:58:27 (1709th Cat.) Awesome performances all round. 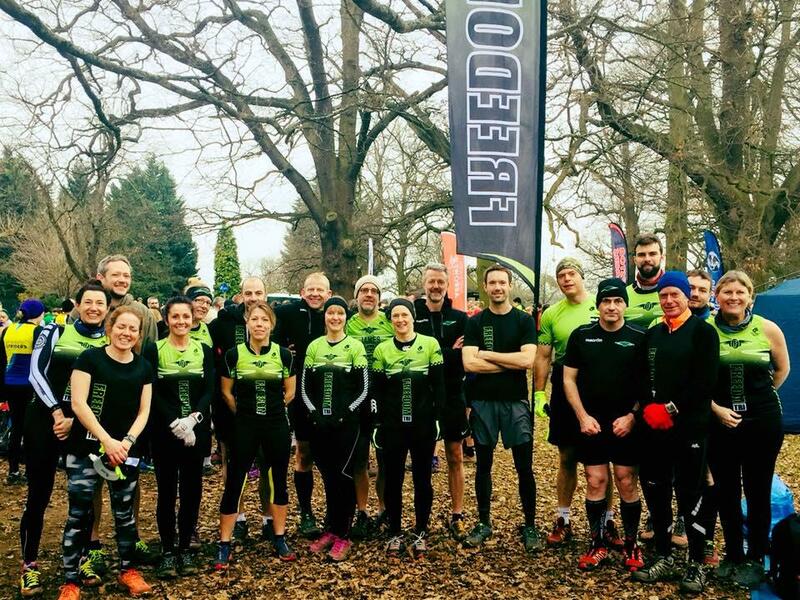 Well done Freedomites for flying the wings at running's most gruelling long distance race. Sara O'Callaghan at the London Marathon. Photo credit: Emma Croxon. 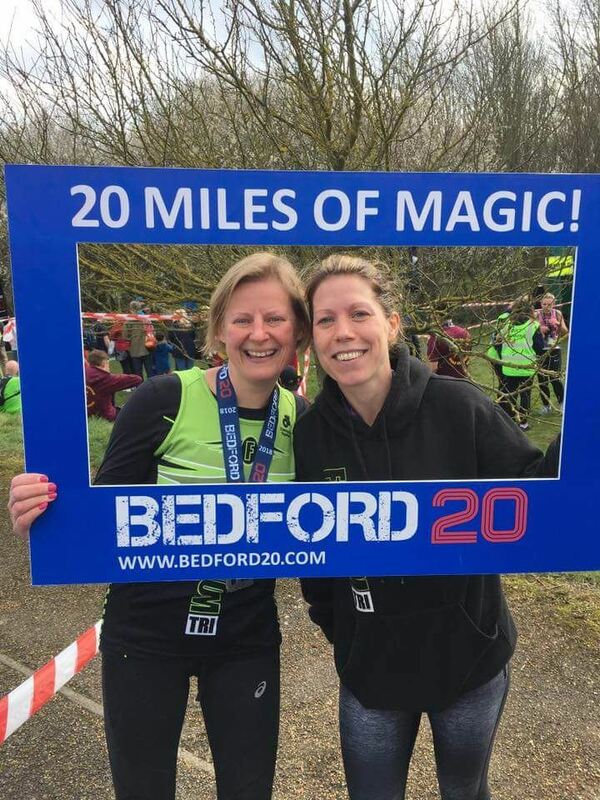 The '20' is the perfect race distance for long distance runners to test their fitness in quality race conditions as was the case at Bedford. It was a nice, flat scenic course on a mixed terrain of path, trail and grass. If you were after a PB - this was the place to do it! Freedom Tri has some excellent runners amongst its ranks. None more so than Michael Mullender who came over the line in 2:37:17; Rachel Carling in 2:40:21; Tracey Palmeiri 2:40:21; with Gareth Sharp, Liz Aitken & Sara O'Callaghan in a joint time of 4:08:55. Sara is en-route to London in April whereas Liz is in full training mode for the Pembrokeshire Ultra in May. 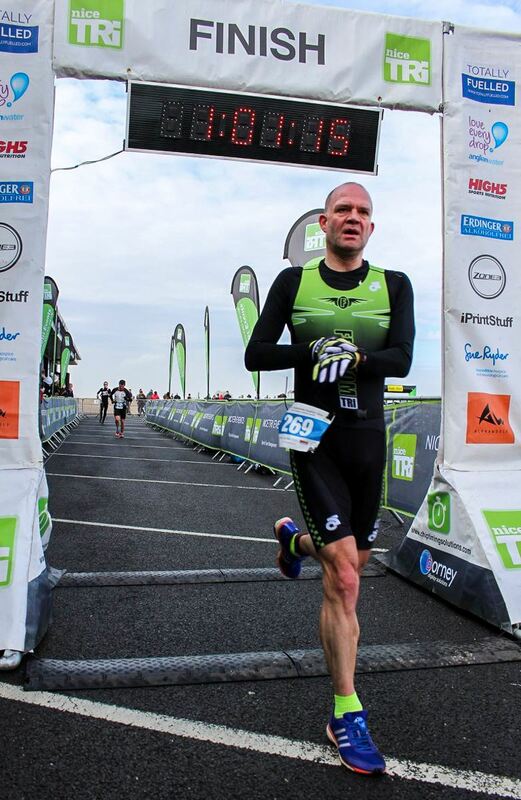 Gareth is keeping it local and will be toeing the start line at the Milton Keynes Marathon also coming up in May. We wish them well! Rachel Carling & Tracey Palmeiri at the Bedford 20. Wasn't it only last week the country was battling blizzards and covered in a thick blanket of snow? Well before you know it the multisport season has arrived! Keen to blow away the winter cobwebs and put all that winter training to good use was Freedom's Chris Belcher and Peter Carpenter. Nice Tri's annual Bedford Autodrome Duathlon is always a popular early calendar race, run on the slick professional motorsport track. The race format comprised 5k run/20k bike/2.5k run and was a hotly contested ITU age group qualifying race too. Chris crossed the line in 107th place, 13th in AG with 1:01:17 and Peter 231st place, an impressive 3rd in his AG with 1:38:04. Chris awaits the results from Clumber Park to see if he was successful in his bid to join this year's GB squad in Denmark. Good luck Chris! Over at the Barcelona Marathon James Parsons & Chris Clark crossed the finish line together in 1076th & 1077th place in a very impressive 3:12:29. Well done to everyone who took part this season, it was great to see so many of you. Some special mentions to Rachel Carling, Richard Pitcairn, Tracey Palmieri, Bettina West and Jenny Cotter who came 2nd, 2nd, 3rd, 6th and 10th in age group respectively. Huge congratulations to Rachel and Richard who have each won a trophy to be presented at the AGM in April which you are welcome to attend if you wish. League running continues with a series of 5 x 10k races in the mid-week league organised by Angela Phillips during May/June/July. As with the XC league, ALL are welcome. Don't be shy, come and try it, they are fantastic events with free cake at the end! Last Sunday saw Cambridge play host to it's annual half marathon. The day was marked with scandal after race winner Jack Gray was disqualified having used his colleague's race number at the last minute and hadn't even paid an entry! Laying down an early season marker, Freedom Tri were out in full force with James Thomas leading the charge in 1:26:36 closely followed by Martin Hawke in 1:28:17 and Paul Fairchild in 1:28:59. 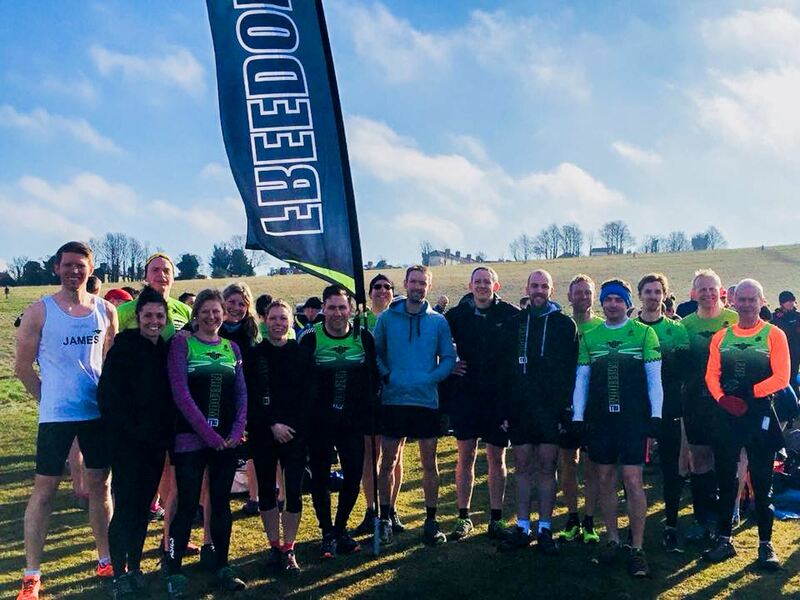 Other Freedom times: Mark Allen 1:40:07; Rob Evans 1:54:34; John Phillips 1:58:32; Emma Croxon 1:58:41; Emma Kinsey 2:01:23; Andrew Fenton 2:03:24; Gareth Sharp 2:10:47; Sarah Taylor 2:13:56 and Sara O'Callaghan in 2:15:50. 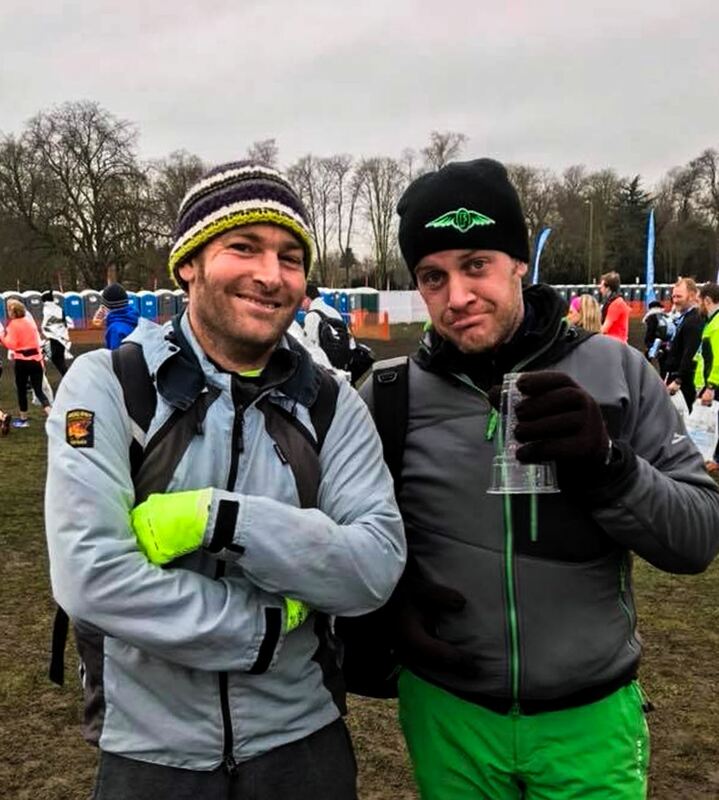 Martin Hawke & Rob Evans at the Cambridge Half Marathon. Photo credit: Mark Allen. Last weekend the cross country season was brought to a close with the most challenging of courses. Set on the rolling hills of Royston Heath. This meant runners with either hyper ventilating up a hill or down the 5.5 mile course, with very few flats to recover in between. As to be expected Freedom Tri had an impressive turn out with everything to play for in the last race of the season, with 5 Freedom league points up for grabs too. The combined results were as follows: 32nd Matt Sayers 38:22; 36th James Parsons 38:35; 80th James Thomas 42:08; 100th Ben Field 43:25; 102nd Paul Fairchild 43:35; 112th Chris Clark 44:08; 113th Adam Jenkins 44:10; 133rd Tracey Palmieri 45:27; 156th Rachel Carling 47:37; 180th Bettina West 49:07; 230th Adrian Robinson 52:08; 247th Matt Cotter 53:54; 308th Richard Pitcairn 58:49; 316th James Knight 60:06; with 317th Jane Britten 60:07. Huge congratulations to all, but especially the women's masters team who resulted in coming FIRST out of twenty teams! Not bad for a triathlon club! Freedom Tri cross country team out in force at Royston. Photo credit: Jane Britten. 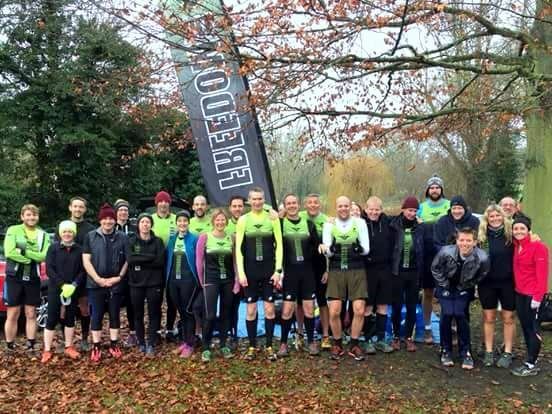 Another crackin' turnout at the Watford 5 mile cross-country race last weekend saw James Thomas leading the club home in 41:54 followed by Chris Clark in 42:23; club captain Paul Fairchild in 42:43; Adam Jenkins 44:11; Steven Carrod 44:16; Tracey Palmieri 44:29; Tom Rix 47:16; Jenny Cotter 48:32; Bettina West 49:07; Anna Weller 50:58; Matt Cotter 53:03; James Knight 54:25; Jane Britton 54:25; Christine Caine 54:57; Amanda Maylin 55:00; Richard Pitcairn 57:14; Mark Bullivant 60:22; Rachel Kelley 62:25. Gareth Charles unfortunately DNF. Freedom Tri are currently 12th out of 20 teams with the women's masters team currently in 5th place! After his successful XC race James Thomas then went onto successfully complete the Gran Canaria Half Marathon this weekend in 170th place with a very impressive time of 1:29:53. Freedom Tri cross county team at Watford. 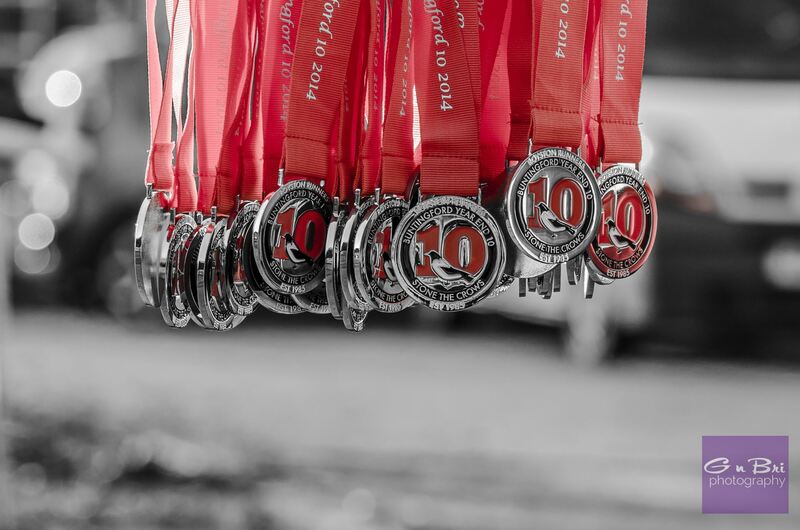 What better way to see out 2017 than at Roystons Runner's Buntingford 10 miler? There to put down a marker for the coming year was Richard Springall who was first for Freedom in 41st place with 1:05:25; followed by James Parsons 57th in 1:08:16; Chris Clark 66th in 1:09:18; Jenny Cotter 121st in 1:16:32; Angela Phillips 250th in 1:27:12; Gregor Bowie 267th in 1:28:36; Sara O'Callaghan 408th in 1:45:07 and Sarah Taylor 409th also in 1:45:07. And so it was, 26 blurry eyed Freedomites gathered together on Willian green for the third installament of the Run Herts cross country league. With temperatures barely above freezing and the excesses of the previous night's Christmas party sadly all too visible. Pirate bandanas and bad eye liner were the favoured look for this morning's sporting endeavours, with energy drinks being exchanged for tots of Morgans rum. The starting gun was the first realization for most that they were actually at a race and that people would have to dig deep to complete the frozen 5 mile course. In the women's race Rachel Carling, Tracey Palmieri and Jenny Cotter were the first three for Freedom over the line in 37.06; 37.07 & 38.20. Over in the men's race Bryon Nicholl, James Thomas and Paul Fairchild led the charge in 31.02; 32.41 & 33.35. The overall club standings after race three put Freedom Tri in 12th place in the league. The women's team are in seventh place with the men's team in 10th. Special mention goes to the women's masters team who are in sixth place! Arrrghhhh me hearties!!! !